Planning a visit to Manila? 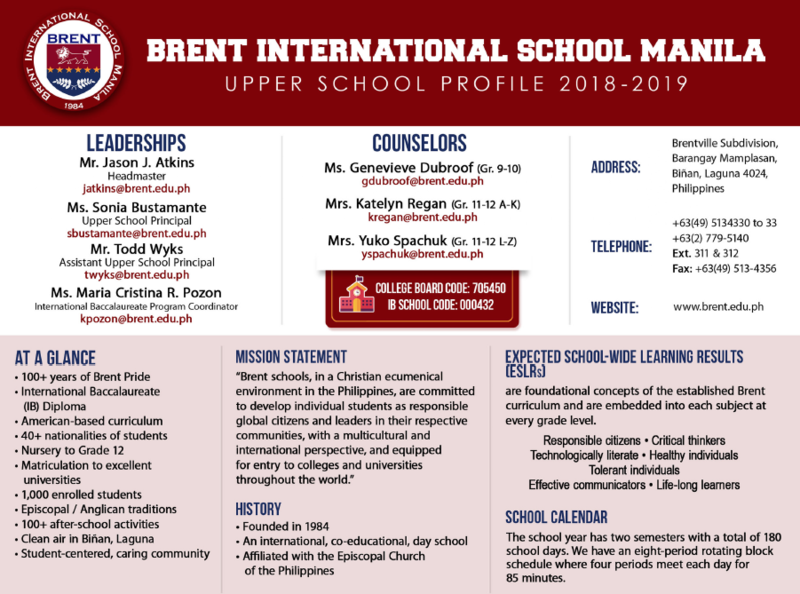 We would like to encourage college and university admissions professionals to visit the students of Brent International School Manila. Every year, we typically host representatives from many schools in the US, Canada, Australia and New Zealand, Japan, Korea, Philippines, Spain, Germany, India, Singapore, Hong Kong, Hungary, and Switzerland. We encourage visits from schools around the world. If you are interested in visiting, please contact our Guidance Office. Brent is an International, co–educational, day school associated with the Episcopal Church in the Philippines. Brent Schools are committed to developing individual students as responsible global citizens and leaders in their respective communities, with a multicultural and international perspective, and equipped for entry to colleges and universities throughout the world. The Brent Manila family includes students from more than forty–six countries. Within a Christian environment, the school seeks to help students become rational, intellectually curious, and receptive to new ideas. The academic program at Brent International School Manila, is organized to flow from our mission statement and our Expected School–wide Learning Results (ESLRs). A rigorous college preparatory program is ensured through the International Baccalaureate program. When visiting Manila, please consider visiting other Manila International School Counselors Association(MISCA) schools. MISCA schools include International School Manila, British School Manila, Chinese International School, German European International School, Everest Academy, Beacon Academy, United Campus of MGIS and Australian International School, Southville International School, and several others. For contact information please email lzusguidance@brent.edu.ph. Metro Manila has many options for hotels from boutique to five star. Most traveling representatives choose to either stay near the airport or in Makati. Another possibility is to stay in the Bonafico Global City (BGC), which is approximately 5-7 km from the airport and is located between the international schools. Coming from Makati or the airport, you will need to take the South Luzon Expressway (SLEX). You will head South, in the direction of Alabang and Laguna. Brent is located about 25 km South of Makati. You will exit at the Mamplasan exit, in Laguna. Once you go through the tollbooth, you will come to an intersection. Turn left at the intersection, which will lead you to a bridge over the highway. At the second right turn, you will turn into the Brentville subdivision and make your way to the school drop-off point. Drivers can park in our underground parking area. When you check in with security, you will be given a visitor’s badge. If you are hiring a car/taxi, please hire for the entire time, including return trip back. You will not be able to hire a taxi from the school. Though Uber and Grab Taxi are popular options in Metro Manila, their reach has not extended down to where BISM is located. Brent does not provide the specific rank of our students. The cumulative GPA of our students reflects courses taken at Brent only. Grades from previous schools are not included in the factoring, however we will attach the previous schools’ transcripts to our transcripts. IB Higher Level courses are marked (IBHL) on transcripts and receive an additional weighting of .50.